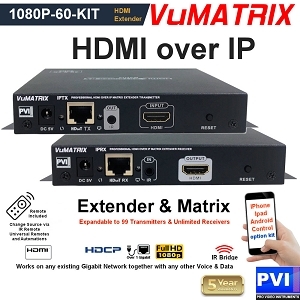 The VUMATRIX 1080P-60-KIT is a Full-HD 1080p-60 HDMI Over IP Extender solution, expandable with multi-to-multi hdbit matrix functionality at any time, ideal choice to extend in real time any HDMI Video up to Full HD 4:4:4 60 HDMI HDCP over any CAT6 cable up to 500FT as well any distance over the existing IP Ethernet network sharing your Gigabit Switches, Gigabit Routers, and Hi-Speed 5G Wifi. Installation is simple, plug n play, for everyone, simply by connecting the Transmitter unit and the Receiver unit to your stand alone point to point CATx CABLE, or via your standard 1-Gigabit IP network switches & routers ( also multiple in cascade ), with no need for any particular switch or router, nor special configurations, coexisting with any other IP traffic without requiring a dedicated network. The units auto-detect the network ( with or without a dhcp router ) and perform all settings automatically without requiring any manual setting (switch & routers must be standard igmp multicast streaming video multimedia capable). Static ip are also possible for special custom installations. Every VuMATRIX transmitter and receiver comes with an IR Infrared Eye to extend any IR Remote control command from the TV Viewing point back to the video source at the transmitter point, to control any play/stop/change channel over the connected source in real time. The VuMATRIX can also be expanded to HDBIT Matrix over ip system by adding up to 99 transmitters and unlimited receivers over your ip network, anywhere, at any distance, setting each transmitter id from the transmitter front panel display, then pointing to the wanted ID on each receiver via the receiver front panel or the IR remote control included with each receiver. API or IR commands can also be learned on any Automation system, to change the channels and control devices from any third party software or programmable IR remote controls. The VuMATRIX systems can also be controlled from your Iphones / Ipads / Galaxy / Android by adding the VuMATRIX Smart-Control-box accessory to your IP network then downloading our VuMATRIX Free control app from App Store and/or Google Play. 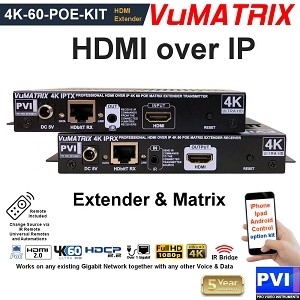 The VUMATRIX 1080P-60-KIT is operated via the included power supplies, and can inter-operate and mix with different models of 2018 VuMATRIX up to the max resolution supported by the connected receiver/s (a 1080p only receiver cannot play 4K). The VUMATRIX 1080P-60-KIT sets the new standard for the HDMI over IP video distribution, with true plug 'n play simple installation for every one anywhere, perfect quality, channels expandability with matrix switch features, Smart-Phone & Tablet control, and Best Price on the Market with 5 Year Warranty. PVI VUMATRIX 4K-KIT distribute your HD and 4K video over your existing 1 gigabit ip ethernet lan network switch router with simple plug 'n play installation anywhere. Simply add one Vumatrix transmitter per each of your Video Sources you want to distribute, and one Vumatrix Receiver behind each TV connected to the TV HDMI port. You can always expand the system as you need at any time by simply adding more Vumatrix HDMI Over IP Transmitters and Receivers. Use our FREE APP on your Tablets and Smart Phones to switch any TV to the wanted hdmi source in one click. With our app you can create PRESETS to click and switch multiple TVs to the wanted source, ideal for commercial, bar, schools, churces, home events, etc, with the ability to define sources, destinations and presets names. Matrix Switch Control can also be done from ir infrared remote controls and any home automation. With Vumatrix you can install all your HDMI video sources in one closet, then decide room by room, tv by tv, which source you want to watch Each Vumatrix unit includes the IR Infrared over ip bridge so you can remote-control the watched source from any room and any tv with the regular remote. There is no need for any special switch nor configuration, simply set the ID number per each transmitter on the transmitter display, then start using your video network. The VUMATRIX is the ideal, simple to install, professional, cost effective Newest solution for any HDMI OVER IP Matrix and Video Distribution, were perfect quality and simple reliable operation for everyone are wanted. PVI VUMATRIX HD-4K-POE-KIT distribute your HD and 4K video over your existing 1 gigabit ip ethernet lan network switch router with simple plug 'n play installation anywhere, also using the POE power over ethernet where available so there is no need to use the included AC power adapter. 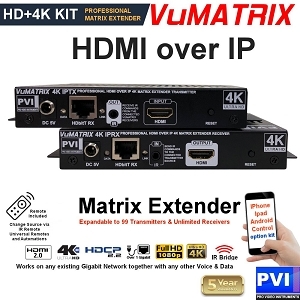 Simply add one Vumatrix transmitter per each of your Video Sources you want to distribute, and one Vumatrix Receiver behind each TV connected to the TV HDMI port. You can always expand the system as you need at any time by simply adding more Vumatrix HDMI Over IP Transmitters and Receivers. Use our FREE APP on your Tablets and Smart Phones to switch any TV to the wanted hdmi source in one click. With our app you can create PRESETS to click and switch multiple TVs to the wanted source, ideal for commercial, bar, schools, churces, home events, etc, with the ability to define sources, destinations and presets names. Matrix Switch Control can also be done from ir infrared remote controls and any home automation. With Vumatrix you can install all your HDMI video sources in one closet, then decide room by room, tv by tv, which source you want to watch Each Vumatrix unit includes the IR Infrared over ip bridge so you can remote-control the watched source from any room and any tv with the regular remote. There is no need for any special switch nor configuration, simply set the ID number per each transmitter on the transmitter display, then start using your video network. The VUMATRIX is the ideal, simple to install, professional, cost effective Newest solution for any HDMI OVER IP Matrix and Video Distribution, were perfect quality and simple reliable operation for everyone are wanted. 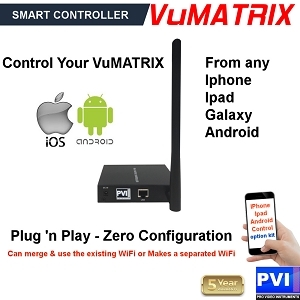 The VUMATRIX SMART CONTROLLER extends the control of your entire VuMATRIX HDMI over IP video distribution network over any IPAD IPHONE GALAXY ANDROID Smart Phones and Tablets with the ability to auto discover any new installed VuMATRIX Transmitter and Receiver as well assign a Name for easy recall and switch any source to any destination. The VuMATRIX SMART-CONTROLLER is completely plug 'n play and does not require any manual setup, integrating with your existing network and your wifi. Simply download the ProVideoInstruments Matrix Control App to your device and the app will automatically find our SMART CONTROLLER, scan the network, and list all your VuMATRIX Transmitters & Receivers, you can name with the names you want, and store / recall as you need. Switching between sources and TVs is simple, drag and drop, real time. The VUMATRIX SMART CONTROLLER is the perfect companion for any VuMATRIX HDMI over IP video distribution allowing a visual instantaneous switch between sources and display from any room. 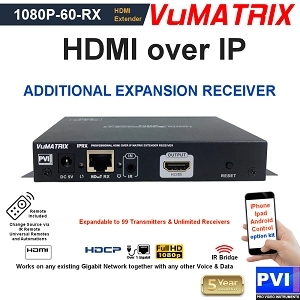 The VUMATRIX 1080P-60-RX is a Full-HD 1080p-60 HDMI Over IP Extender EXPANSION RECEIVER, to add an additional video / tv / monitor / projector ( point of visualization ) to the VuMATRIX video over ip matrix network systems, over the existing IP Ethernet network sharing your Gigabit Switches, Gigabit Routers, and Hi-Speed 5G Wifi. Installation is simple, plug n play, for everyone, simply by connecting the Receiver unit to your standard 1-Gigabit IP network switches & routers ( also multiple in cascade ), with no need for any particular switch or router, nor special configurations, coexisting with any other IP traffic without requiring a dedicated network. The unit auto-detect the network ( with or without a dhcp router ) and perform all settings automatically without requiring any manual setting (switch & routers must be standard igmp multicast streaming video multimedia capable). Static ip are also possible for special custom installations. Every VuMATRIX receiver comes with an IR Infrared Eye to extend any IR Remote control command from the TV Viewing point back to the video source at the currently-selected transmitter point, to control any play/stop/change channel over the connected source in real time. The VuMATRIX video over ip systems can be expanded up to 99 transmitters and unlimited receivers over your ip network, anywhere, at any distance, setting each transmitter id from the transmitter front panel display, then pointing to the wanted ID on each receiver via the receiver front panel or the IR remote control included with each receiver. API or IR commands can also be learned on any Automation system, to change the channels and control devices from any third party software or programmable IR remote controls. The VuMATRIX systems can also be controlled from your Iphones / Ipads / Galaxy / Android by adding the VuMATRIX Smart-Control-box accessory to your IP network then downloading our VuMATRIX Free control app from App Store and/or Google Play.  The VUMATRIX 1080P-60-RX is operated via the included power supply, and can inter-operate and mix with different models of 2018 VuMATRIX receiving from any transmitter up maximum 1080p (4K signals cannot be received) . The VUMATRIX sets the new standard for the HDMI over IP video distribution, with true plug 'n play simple installation for every one anywhere, perfect quality, channels expandability with matrix switch features, Smart-Phone & Tablet control, and Best Price on the Market with 5 Year Warranty. The VUMATRIX HD60-4K30-RX is a Full-HD 1080p-60 + 4K UHD-30 HDMI Over IP Extender EXPANSION RECEIVER, to add an additional video / tv / monitor / projector ( point of visualization ) to the VuMATRIX video over ip matrix network systems, over the existing IP Ethernet network sharing your Gigabit Switches, Gigabit Routers, and Hi-Speed 5G Wifi. Installation is simple, plug n play, for everyone, simply by connecting the Receiver unit to your standard 1-Gigabit IP network switches & routers ( also multiple in cascade ), with no need for any particular switch or router, nor special configurations, coexisting with any other IP traffic without requiring a dedicated network. The unit auto-detect the network ( with or without a dhcp router ) and perform all settings automatically without requiring any manual setting (switch & routers must be standard igmp multicast streaming video multimedia capable). Static ip are also possible for special custom installations. Every VuMATRIX receiver comes with an IR Infrared Eye to extend any IR Remote control command from the TV Viewing point back to the video source at the currently-selected transmitter point, to control any play/stop/change channel over the connected source in real time. The VuMATRIX video over ip systems can be expanded up to 99 transmitters and unlimited receivers over your ip network, anywhere, at any distance, setting each transmitter id from the transmitter front panel display, then pointing to the wanted ID on each receiver via the receiver front panel or the IR remote control included with each receiver. API or IR commands can also be learned on any Automation system, to change the channels and control devices from any third party software or programmable IR remote controls. The VuMATRIX systems can also be controlled from your Iphones / Ipads / Galaxy / Android by adding the VuMATRIX Smart-Control-box accessory to your IP network then downloading our VuMATRIX Free control app from App Store and/or Google Play. The VUMATRIX HD60-4K30-RX is operated via the included power supply, and can inter-operate and mix with different models of 2018 VuMATRIX receiving from any transmitter up maximum 4K UHD 4:2:0 @ 30. The VUMATRIX sets the new standard for the HDMI over IP video distribution, with true plug 'n play simple installation for every one anywhere, perfect quality, channels expandability with matrix switch features, Smart-Phone & Tablet control, and Best Price on the Market with 5 Year Warranty. The VUMATRIX H4K60-POE-RX is a Full-HD 1080p-60 + Full 4K UHD-60 4:4:4 18 Gbps HDMI Over IP Extender EXPANSION RECEIVER, to add an additional video / tv / monitor / projector ( point of visualization ) to the VuMATRIX video over ip matrix network systems, over the existing IP Ethernet network sharing your Gigabit Switches, Gigabit Routers, and Hi-Speed 5G Wifi. Installation is simple, plug n play, for everyone, simply by connecting the Receiver unit to your standard 1-Gigabit IP network switches & routers ( also multiple in cascade ), with no need for any particular switch or router, nor special configurations, coexisting with any other IP traffic without requiring a dedicated network. The unit auto-detect the network ( with or without a dhcp router ) and perform all settings automatically without requiring any manual setting (switch & routers must be standard igmp multicast streaming video multimedia capable). Static ip are also possible for special custom installations. Every VuMATRIX receiver comes with an IR Infrared Eye to extend any IR Remote control command from the TV Viewing point back to the video source at the currently-selected transmitter point, to control any play/stop/change channel over the connected source in real time. The VuMATRIX video over ip systems can be expanded up to 99 transmitters and unlimited receivers over your ip network, anywhere, at any distance, setting each transmitter id from the transmitter front panel display, then pointing to the wanted ID on each receiver via the receiver front panel or the IR remote control included with each receiver. API or IR commands can also be learned on any Automation system, to change the channels and control devices from any third party software or programmable IR remote controls. The VuMATRIX systems can also be controlled from your Iphones / Ipads / Galaxy / Android by adding the VuMATRIX Smart-Control-box accessory to your IP network then downloading our VuMATRIX Free control app from App Store and/or Google Play. The VUMATRIX 4K60-POE-RX is operated via POE Power Over Ethernet ( 5 watts per each module ) or the included power supply, and can inter-operate and mix with different models of 2018 VuMATRIX receiving from any transmitter up industry top 4K UHD 4:4:4 @ 60. The VUMATRIX sets the new standard for the HDMI over IP video distribution, with true plug 'n play simple installation for every one anywhere, perfect quality, channels expandability with matrix switch features, Smart-Phone & Tablet control, and Best Price on the Market with 5 Year Warranty.